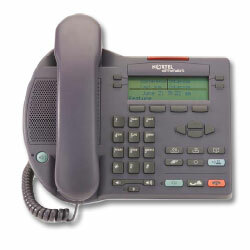 The Nortel IP i2002 Phone (Phase 1) - Nortel Networks internet telephone - is a standards-based, Internet Protocol, desktop telephone that connects directly to the Local Area Network (LAN) via RJ-45 connector. Currently supported on both enterprise and carrier platforms, the display-based IP Phone 2002 is ideally suited for moderate call volume users, such as office professionals and technical specialists. Reduced enterprise installation costs by only requiring a single Cat. 5 cable drop to the desktop for telephone and co-located PC. The IP 2002 Phase 1 Internet Telephone is supported by multiple Nortel Networks communication systems, including Business Communications Manager (BCM), IP-enabled Meridian 1* and Meridian SL-100 systems (with Internet Telephony Gateway cards installed), and Succession Communication Servers.